There is much discussion and confusion around the issues of gender equality and gender roles, and the church is not exempt. Some even believe that the Bible contributes to sexism against women and that God is, in some way, sexist. 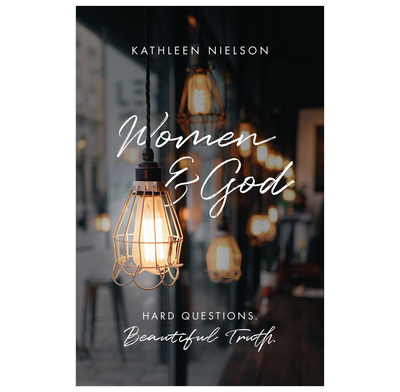 In this warm, conversational and sympathetic book, Kathleen Nielson looks at what the Bible really says about women and what it reveals about God’s attitude towards them. She asks the hard questions about the Old Testament Law, the role of women in marriage and the role of women in the church, consistently pointing us to God’s word and his perfectly created order. Take a look at the issues here. She not only provides Biblical reasoning in answer to these questions, but also shows how the truth can be enjoyed as women and men submit to the perfect will of our compassionate, merciful and gracious God. Women and men of all backgrounds, views, and ages will find this a valuable book. Pastors and Elders will will find it useful as they work out how to faithfully lead a united worshipping community under the authority of Christ and in accordance with Scripture. It is also ideal for use in women's ministry as women seek to live and act according to God’s will. I loved this book! Women and God is more than just an overview of the roles of women in the family and the church. It tackles all the usual texts as well as the more shocking and perplexing ones that other people sometimes avoid. Kathleen anticipates all the questions and objections that people have, and then answers them from the text with wisdom, clarity, and sensitivity. What makes this book so compelling is her conviction that God is good, and that women can have confidence that living by his word is a beautiful thing and for our good. word. As you read the book, it is easy to see that Kathleen herself delights in the goodness of God’s plan for women as she carefully and winsomely seeks to show us how that goodness runs throughout the whole Bible. As we face a new post-christian world, we need this book. Warm, engaging, inviting, articulate, and convincing, this book models how Christians can face this world's hard questions about gender and sexuality with the gospel's beautiful truths. Reading this book feels like a long conversation with a safe friend, steaming mug of tea in hand. Kathleen proclaims gospel light without erasing her readers' diverse points of view or lived experiences. You will find no platitudes, no cliches, no tired defenses of priggish moralism. Instead, you will find Jesus, the Word made flesh, arms open. I did enjoy this book but did struggle with it a bit. It seemed to hop around a lot and was inconsistent at times in its themes. I’m not sure it told me anything new in this field and wasn’t quite what I had expected. I’d still recommend it to people though if they were interested in this area of theology. I was so happy when I saw that this book was being released! I've been trying to explore the field for the last couple of years, as I come from a background where it was never questioned that women were ministers, but when I went to university I was met with a whole new set of ideas about this - and knew that I needed to explore it for myself to come to a decision on what I believed. This book has been one of the most helpful on that journey - my one complaint would be that sometimes the application seems to leap a bit far from the rest of the text, like a step or two is missing. However, most of the argument and discussion is logical, and I found it very helpful in presenting a good, clear and academic case for complementarianism. Thank you! Discussing women's role before God always seems to attract controversy – especially if it's explained by a man! This seems to be more and more the case with every passing year. Therefore, it's so good for a woman to wonderfully explain tricky passages of scripture, delight in complementarianism, and show how much value God places on women. Nielson shows understanding of, and compassion about the abuse of women that has happened within religion, from elevating women as fertility gods, to reducing them to sacrifices. She also empathises with why people may take issue with how woman's role is explained in the Bible. These issues have led to many women questioning why God made them with unique pains, struggles and a supposedly lesser value. But she answers pretty much every question one can think of – why learn about marriage roles if I'm single? How can I worship Jesus the man? Is the 'informal' teaching of Priscilla and Aquila of any less value (answer - no!)? Were commands just for the culture or for all time? Why must women struggle with unique burdens like childbirth? Are Christian sexual standards repressive? Nielson always takes the reader back to the Bible with her answers. She is always quick to point out that abuses and struggles come from sin and she always returns to the creation of man and woman in the Garden of Eden. A woman's body, role and gifts exist to give God glory. Women and God was expertly written, and its goal is to direct people to worship of God. With worship of God as the priority of all people, then tricky passages become easier to understand, the complementarian position becomes a joy, and women can give glory to God. While it was written for women, it was useful to read as man! This book is not just another addition to the discussion of the role of women, but a challenging and thorough look at scripture. We are forced to start by looking about what God says about women throughout the Bible - and whatever our view at the outset we are challenged to think more deeply and grapple with issues that might otherwise be left aside. Really pleased this book has been written. It is a gracious contribution to the often difficult and sometimes divisive subject of women's ministry. Kathleen Neilsen has made a real attempt to address the difficult passages, to understand those who come from a different position and yet to portray the value of what a woman can uniquely offer in her complementary role.I hope many will read it. Easy to read - some excellent chapters - disagreed with her view in part - preferred Trevor Morrow's approach in "Two are equal" which is beautifully and humbly submitted too. I have never read a theology book, centred on women. I found it very difficult to put this book down. I particularly found the way Deborah is shown to be a strong, yet faithfully obedient when working with Barak, enlightening. 'Women and God' is not only a great reference book, but will also as an excellent discussion starter, in all sorts of settings. Kathleen Neilson has definitely become a favourite author of mine.